-US Seller- Free Expedited Shipping! 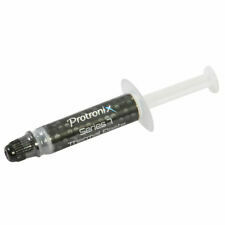 Polysynthetic silver thermal compound paste maximizes thermal conductivity between the CPU and heat sink/fan assembly. Weight: 1.0g/tube Operation Temperature: -50/280°c Thermal Conductivity: >3.17W/m.k, Thermal Resistance: <0.067°c-in2/w 20% metal oxide compounds . Trending at $6.92eBay determines this price through a machine learned model of the product's sale prices within the last 90 days. Thermal conductivity : >0.671 W/m-k. Thermal resistance : <0.06 °C-in2/W. Use for : North-south bridge video card heat dissipation part. Excellent Thermal Conductivity: >3.17W/(m-K) Long-Term Operating Temperature: -22 - 464(F) Odorless, low oil content, non-volatile, non-corrosive, non-toxic, flame retardant, not electrically conductive Grease cleaner and applicator included High stability and reliability 10G tub of high-quality non-curing thermally conductive compound for mid to high-end applications. Suitable for attaching heat sinks, CPU fans, GPU coolers, LED chips, or anything else that requires strong thermal conductivity. For LED / GPU / Heatsink. Thermal Conductive Silicone Glue Adhesive. especially for Northbridge, Southbridge, Mosfet and GPU chip use. 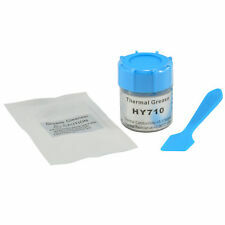 1 x 10g toothpaste style easy to use tube Heat conducting Thermal Glue. Thermal Grease Tube (1g). 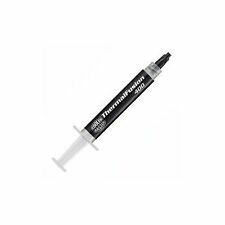 1 X 1g Thermal Grease Tube. protects against CPU Over heat. High Thermal Conductivity. Thermal Conductivity >0.965 W/m-K. Thermal Impedance: <0.255 C-in^2/W. Easy to Apply. 1g Silver Thermal Grease Paste. Free Paste - See below . Easy apply syringe for 7-10 small or 3 -4 large CPU's - when used properly. Higher performance standards compared to White paste. 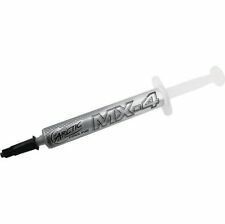 This is the 2019 Edition of Arctic's popular MX-4 thermal Paste. This package contains 4g of MX-4 compound. The ARCTIC MX-4 compound is composed of carbon micro-particles which lead to an extremely high thermal conductivity. It guarantees that heat generated from the CPU or GPU is dissipated quickly and efficiently. Superb in performance, MX-4 is the best companion for overclockers and enthusiasts. Huge 20g Syringe, enough for 50 large CPUs High stability and reliability Excellent Thermal Conductivity: >3.17W/(m-K) Long-Term Operating Temperature: -22 - 464(F) Odorless, low oil content, non-volatile, non-corrosive, non-toxic, flame retardant, not electrically conductive Large 20G syringe tube of high-quality non-curing thermally conductive compound for mid to high-end applications. Suitable for attaching heat sinks, CPU fans, GPU coolers, LED chips, or anything else that requires strong thermal conductivity. Best Value for Thermal Grease Paste. Free Paste - See Below . Easy apply syringe for 7-10 small or 3 -4 large CPU's - when used properly. Buy 1 - Get0 free - you only get 1. Buy 2, Get 3 Free =5. Caution: IC Graphite is electrically conductive! TOP TIER THERMAL PERFORMANCE – The IC graphite pad features a thermal conductivity of 35W/m-k. REUSABLE – You’ll never have to worry about buying thermal paste ever again. Top of the range thermal paste with excellent thermal conductivity, designed for overclocked and watercooled systems. Thermal Conductivity of this product is 12.5 W/mk and thermal resistance of 0.0032 K/W. 100x100x2mm GPU PS3 PS2 XBOX 360 Heatsink Thermal Conductive Pad Blue Thick !! High Insulation & Thermal Conductivity. Thermal conductivity. Thermal Impedance. -Protects against UPC Over Heat. Easy To Apply. WE ARE HERE TO HELP. Mfr Part Number: MX-4 4G 2019 EDITION/ACTCP00002B. Thermal Conductivity: 8.5 W/mK. Product Info. PRODUCT INFO. Product Condition: New. Send the Product to us. Product pictures may not reflect the most recent product revision. Gray Thermal Grease Paste. Thermal Conductivity 0.65 1.93 W/m-K. Thermal Impedance 0.262 0.225 °C- in. Color White Grey. Operation Temperature -30~150 -30~300 °C. -50~240 -50~340 °C. Thixotropic Index 380 /-10 380 /-10 1/10mm. Free Fast Shipping! Great Thermal Material Remover! High thermal conductivity low bleed stable. Thermal coupling of electrical device to heatsinks. Paste Color:Silver. Thermal Conductivity：>1.93W/m. Thermal Rcsistance:<0.120℃-in2/w. BUY 10 RECEIVE TOTAL 40. Easy apply syringe for 7-10 small or 3 -4 large CPU's - when used properly. 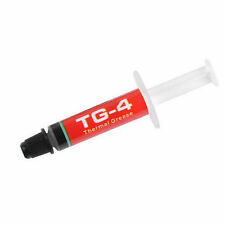 1g Thermal Grease Paste. Free Paste - See below . High performance standards compared to White paste. Thermal Conductivity 0.65 2.5. Features:100% Brand new and high qualityThe Silicone Paste is about 100 gramsHigh conductivity, effective insulationHigh temperature resistant, low oil departs non-corrosive.Working principle: Fill the gap between heating element and the cooling device; Increase the contact area, so as to achieve the soundest effect of thermal conductivity.Method of use: It's normal phenomena, there is a little silicone oil floating above.Please stir well before use.Keep be painted surface clean, and painted directly with tools.Normal temperature preservation.Please cover it after using, avoid impurities such as dust, which will have effect of thermal conductivity.Product Properties:Brand:noModel Number:noType: Conductive Heatsink PlasterHeatsink Material: O. 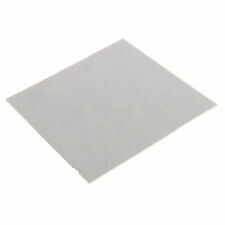 1 x Cooling Thermal Conductive Silicone Pad. material silicone. High thermal conductivity low bleed stable. Thermal coupling of electrical device to heatsinks. Thermal Conductivity：>1.22W/m. Thermal Rcsistance:<0.201℃-in2/w. Paste Color:White. 100% New & High Quality. For LED / GPU / Heatsink. Thermal Conductive. 30g toothpaste style easy to use tube Heat conducting Thermal Glue. especially for Northbridge, Southbridge and GPU cooler use. Bond Peltier, High-Power LED, Video Chip to the Heatsink, etc. 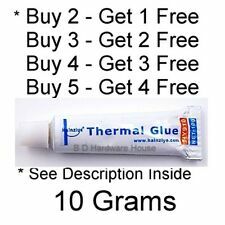 1 x 10g Thermal Glue Tube. This item is NOT thermal paste. Thermal Conductivity >1W/m-k. Thermal Impedance <0.246c-in/W. Color: White. Bonding Strength: 1.8Mpa. Stable between -55~300°C. Continuous Use Temp 200°C. For CPU / GPU HEATSINK. For CPU / GPU Heatsink. 1 x Thermal Cooling Adhesive Tape. 2x 3 RCA AV Audio Video Female to Female Jack Coupler Adapter 3RCA Connector. This is our SOP, for us to be certain and for record purposes. Line Card / Supervisor. We will do what it takes to make it right. BEST REGARDS. We always strive for FIVE-STAR service in every category that you can rate us on. GBIC / Tranceivers SFP / X2. 1x GPU CPU Heatsink Cooling Thermal Conductive Silicone Pad. This is our SOP, for us to be certain and for record purposes. Received Wrong Item/Not as Described. Installation instruction is not included. Trending at $3.43eBay determines this price through a machine learned model of the product's sale prices within the last 90 days. 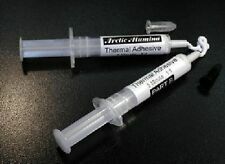 Polysynthetic silver thermal compound paste maximizes thermal conductivity between the CPU and heat sink/fan assembly. Weight: 1.0g/tube Operation Temperature: -50/180°c Thermal Conductivity: >3.05W/m.k, Thermal Resistance: <0.073°c-in2/w 20% metal oxide compounds Polysynthetic silver thermal compound paste maximizes thermal conductivity between the CPU and heat sink/fan assembly. Weight: 1. 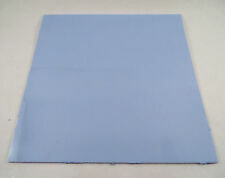 1 x 100x100mm Thermal pads. This is our SOP, for us to be certain and for record purposes. RALINK RT5390 Half-mini Wireless N Card For HP COMPAQ 630703-001 T77H355. We might require you to send us photo/s of the item received and also your original item so we can compare and conduct necessary actions. 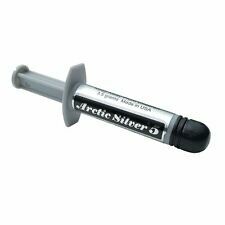 Arctic Silver 5 contains over 88% thermally conductive filler by weight. Arctic Silver 5 is optimized for a wide range of bond lines between modern high-power CPUs and high performance heatsinks or water-cooling solutions. Don't just use any old thermal paste! 1 - Tube of thermal paste. It's one of the best performing thermal pastes on the market, and at a reasonable cost! MacBook Air 11". MacBook Air 13". Parts, tools, and supplies from Beetstech. Over 2200 units sold! Free shipping with tracking! This is the 2019 Edition of Arctic's popular MX-4 thermal Paste. This package contains 8g of MX-4 compound. The ARCTIC MX-4 compound is composed of carbon micro-particles which lead to an extremely high thermal conductivity. It guarantees that heat generated from the CPU or GPU is dissipated quickly and efficiently. Superb in performance, MX-4 is the best companion for overclockers and enthusiasts. Thermal Conductivity. Thermal Impedance. Thixotropic Index. no flowing. Dielectric Constant A. 150°C/24Hours. Thermal compounds and paste can help to prevent your PC CPU from overheating; they work by improving the heat transfer of other computer components. Without these needed thermals, processors can become damaged from overheating. There are many different types of thermal grease conductors available to suit a wide range of needs. What does thermal compound do? Thermal compound is applied between the processor's surface and heat sink to help transfer intense heat that can be built up by the processor. Arctic Silver 5 is one of many different types of thermal grease that can be used in this type of application. How do you apply arctic silver thermal compound or paste? Slowly remove your heatsink from your mainframe (it helps to run your pc for 30 minutes beforehand). Use rubbing alcohol to remove any old thermal paste from the fan and CPU. Apply a pea-sized dot (no more) of compound in the center of the mainframe surface. Slowly place the heatsink on top of the mainframe to spread the thermal paste between the metal of the cooling fan evenly. What else can you use these compounds for? In some PC setups, thermal grease can also be used between northbridge and southbridge motherboard heat sinks and chipset coolers. Overclocking a PC can often result in higher north/south bridge temps that this setup can help out with. The chipset cooling fan works much the same as a mainframe heatsink does. When should you replace thermal paste? How do you remove old thermal paste? Pour a small amount of rubbing alcohol on a cotton ball or swab. Lightly brush both the CPU and cooling fan with the alcohol-soaked cotton ball. Take a coffee filter or clean fine-mesh material and wipe off excess grease.